The Ravens and Steelers meet for the first time this season in primetime on Sunday night. The Steelers look to make it back-to-back wins in primetime after holding off the Buccaneers, 30-27, on “Monday Night Football” last week. Pittsburgh will also be without running back Le’Veon Bell once again as he continues his holdout. Baltimore bounced back last week after a Week 2 loss to Cincinnati, beating Denver 27-14. 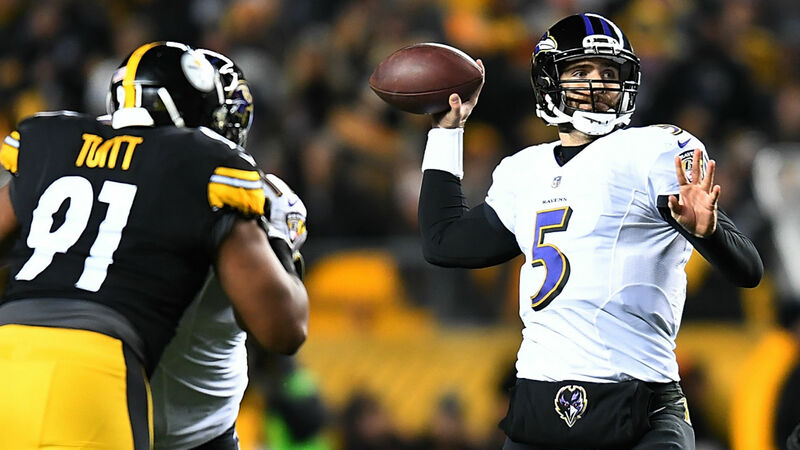 For live scoring updates and highlights from Ravens vs. Steelers in Pittsburgh, follow along here. 9:29 p.m.: FIELD GOAL STEELERS. Pittsburgh caps off a 14-play, 79-yard drive with a 39-yard field goal. Ravens lead 14-6. 9:25 p.m.: Smith-Schuster is injured after an incomplete pass. 9:10 p.m.: FUMBLE. Alex Collins coughs it up at the 1-yard line and the Steelers recover. 9:09 p.m.: Flacco finds Brown for another huge play on a 71-yard deep ball. Ravens with the ball at the Pittsburgh 13-yard line. 9:06 p.m.: FIELD GOAL STEELERS. Pittsburgh puts together a nice drive and finally comes away with some points after a 34-yard field goal. Ravens lead 14-3. 8:57 p.m.: The Steelers have their first big play of the night. Ben Roethlisberger finds JuJu Smith-Schuster for a 38-yard gain. Steelers driving in Baltimore territory. 8:53 p.m.: Both teams trade punts after that second Ravens’ touchdown. 4:33 to go in the first quarter. 8:40 p.m.: TOUCHDOWN RAVENS. Flacco finds running back Alex Collins for the 3-yard touchdown. Ravens lead 14-0. 8:35 p.m.: FUMBLE. On the Steelers first offensive possession of the game, Tony Jefferson of the Ravens strips Vance McDonald of the Steelers and runs it back for a score. After review, Jefferson was down by contact and the Ravens will take over at the Steelers’ 31-yard line. 8:29 p.m.: TOUCHDOWN RAVENS. Joe Flacco airs one out for John Brown for the 33-yard score. Ravens lead 7-0. 8:22 p.m.: And we’re off, the Ravens will get the ball to start the game. 7:52 p.m.: Antonio Brown getting loose pregame. 7:28 p.m.: Inactives for tonight’s game. Just under an hour until kickoff. T20 Blast Finals Day 2018: When is it, can I still get tickets, what TV channel and live stream is it on and which teams are playing?